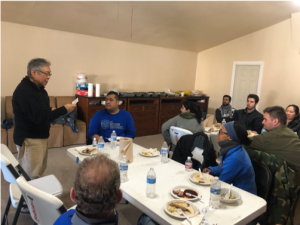 On a bleak and windy day, in the ranch lands of Texas, 30 veterans, refugees, and representatives of local businesses came together to lend a helping hand to a beleaguered Cambodian community in Rosharon, Texas. The area was hit hard by Hurricane Harvey and while many neighborhoods left ruined in the storm’s wake rebuilt, Rosharon was neglected. 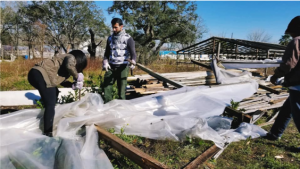 Located on a dry plain halfway between Houston and the Gulf, the Rosharon’s main source of income, spinach farming, was wiped out by the storm. 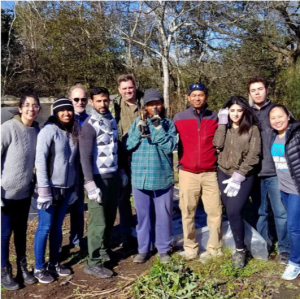 So when members of The Mission Continues reached out to VFAI for a way to give back in honor of Martin Luther King Jr. Day, this community immediately came to mind. 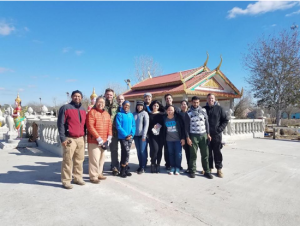 John Vittera and Bre Gaudit, two Army vets, jumped in and began organizing an event to help the residents clean up the Buddhist Rassmey Monastery, the pride of Rosharon. Participants drove and flew in from all over the country, coming from as far away as Minneapolis and New York City to pitch in. A van left Austin at five in the morning to collect travellers at airports, Starbucks, and local homes. Hours later, as we drove into town, we were shocked by what we saw. Shotgun shacks on dirt roads still had blue tarps covering parts of their roofs, despite the fact that Hurricane Harvey hit more than 18 months prior. It reminded us of our experiences in combat zones overseas rather than a community 30 minutes south of one America's wealthiest cities. We pulled into the temple grounds, driving under a large, ornate, red arch. The neighborhood ran out to greet us from the various buildings of the Buddhist temple, which seemed out of place in the Texas plains. Paul, the leader of the community, welcomed us and showed us where we could be most helpful. Piles of debris were strewn around the grounds of the temple, which was not only aesthetically unpleasant, but also dangerous as it was causing wide portions of the complex to be impassable. Two-thirds of our crew got to work plowing through the mess with efficiency. Ben Parry, a former Army cavalry officer, led the charge organizing people into small teams to tackle sectors of the compound. Carlis Miller, a Marine veteran, used his pickup truck to move piles of wood and rubble, as well as discarded appliances. The debris was collected into a large pile, from which a waste management company could easily remove it from the grounds. The rest of our group began unloading school backpacks collected by The Alliance Texas for children in the community. Parents streamed in, navigating the unpaved roads turned to mud from the previous night’s rain. As they came into the temple, each person removed their shoes and waited patiently in line. The bags were filled with school supplies, books, pens, pencils, and folders. Since the nearest grocery store is 20 minutes away by car, these things were hard to come by. Gislaine Williams of the Alliance and Adrinana Leung from Starbucks distributed the bags for more than an hour, handing out one hundred backpacks to families in need. After lunch, we finished the projects and began to pack up. When it was time to leave, only a few members of the temple community were left to say goodbye. The cold and wind had pushed the rest into the shelter of their homes. We shook their hands as they expressed their gratitude. We left with feeling accomplished, though we only made a small dent in the massive rebuilding needs of the community. We must have been quite the picture, veterans, human rights workers, refugees, religious leaders, and politicians, all working together for a common cause. We brought people together from all over Houston to work with a different generation of refugees. Iraqis, like Dina Al Bayati, who came to the US in 2009, put on her work boots to serve Cambodians fleeing the Khmer Rouge in the 1970’s. Those types of relationships are hard to quantify, but they’re what makes us Americans. In this country it doesn’t matter who your parents were, what god you worship, or where you came from. It doesn’t matter whether you’re descended from those on the Mayflower or got off the plane from a different country last night. What matters is that you’re here and that you’re willing to make your community a better place. That was the real impact of this project and the real message of Dr. King that day.